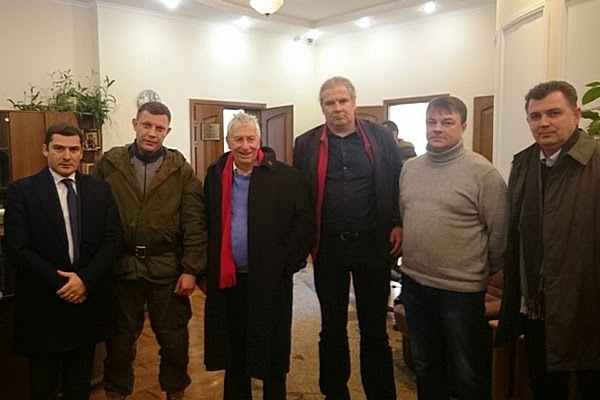 Just two weeks after the leader of the pro-Russian right-wing terrorist organisation "Donetsk People's Republic" (DNR) Aleksandr Zakharchenko declared that Ukraine was run by "miserable Jews", a delegation of the German party Die Linke visited the author of this anti-Semitic jibe and delivered what they called "humanitarian help". 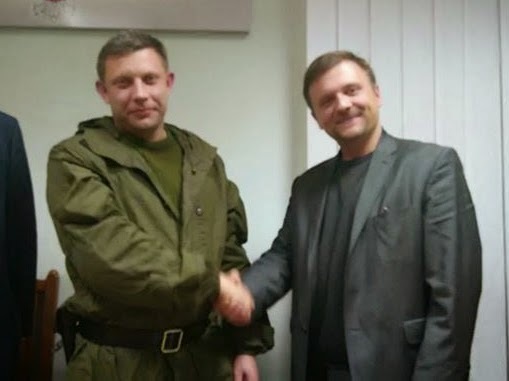 Previous foreign visitors of right-wing terrorist Zakharchenko included representatives of the European extreme right organisations who have particular links to Die Linke, on which more below. 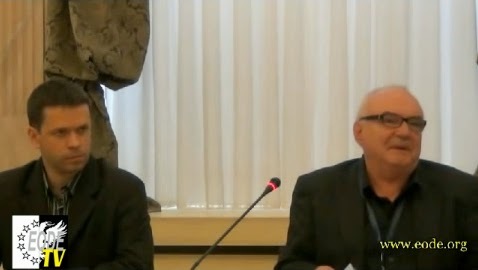 Both Wolfgang Gehrcke and Andrej Hunko entered Eastern Ukraine illegally. They first travelled from Germany to Moscow's Sheremetyevo International airport and then - to the Russian city of Rostov. From there, they went to Ukraine via a segment of the Ukrainian-Russian border that was not controlled by the Ukrainian authorities. Hence, they entered Ukraine without passing any Ukrainian border control point which constitutes an administrative offense (unauthorised border crossing). No internationally recognised body (OSCE or Red Cross) was able to check the contents of Die Linke's alleged "humanitarian help". 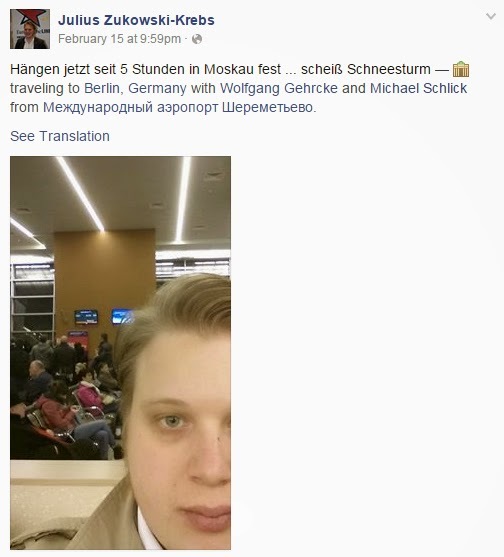 Originally they travelled together with another Die Linke's member Julius Zukowski-Krebs, who was going to violate the Ukrainian border too, but he says that he was attacked by a dog and did not go to Ukraine. 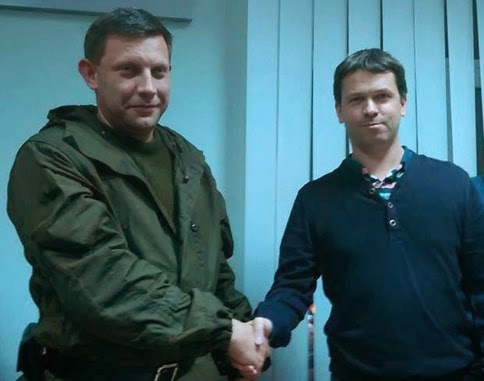 Illegal entry in Ukraine and the picture that Die Linke's representatives took together with right-wing terrorist Zakharchenko constitute a very clear political message: Die Linke respects neither the territorial integrity nor the laws or the sovereignty of Ukraine. Furthermore, by entering Ukraine via Rostov, Gehrcke and Hunko followed the route of the Russian troops that continue their invasion of Eastern Ukraine to help the DNR terrorists in their occupation of of particular territories. This is not the first time when Die Linke cooperated with the pro-Russian extreme right and Putin's right-wing authoritarian regime. In March 2014, Die Linke's representatives Hikmat Al-Sabty, Torsten Koplin (former informant of Stasi), Piotr Luczak and Monika Merk joined German far-right activist and Russia Today celebrity Manuel Ochsenreiter in their trip to the Autonomous Republic of Crimea - then occupied by the Russian troops - to "observe" the illegitimate and illegal "referendum" on the status of Crimea after which Russia annexed this Ukrainian region in violation of every international norm. It is worth reminding that "observers" of the Crimean "referendum" were invited by two organisations: the Eurasian Observatory for Democracy & Elections (EODE) and the European Centre for Geopolitical Analysis (ECGA). The EODE is headed by Belgian fascist Luc Michel, the leader of the "National-Bolshevik" Parti Communautaire National-européen. The ECGA is headed by Polish far right activist Mateusz Piskorski, a former member of neo-Nazi pagan Niklot group and the right-wing populist Samooborona political party, and contemporary founding member of the "National-Bolshevik" Zmiana party. The activities of the EODE and ECGA are largely funded by Moscow through payments for "observing" and, eventually, legitimising controversial or fraudulent elections and referenda in Eastern Europe, Russia and Asia. Member of Die Linke Piotr Luczak was one of the directors of the ECGA, but decided to found his own branch of the ECGA in Germany in 2011-2012: Europäisches Zentrum für Geopolitische Analyse e.V. Luczak has been closely cooperating with Piskorski’s ECGA and Michel’s EODE. 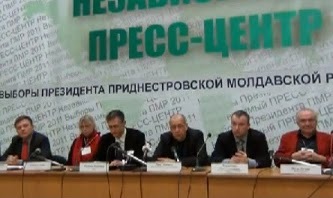 For example, in 2011, Luczak took part in the EODE’s "election observation mission" in Russia. In December 2011, Luczak and yet another member of Die Linke Sabine Golczhyk took part in the joint EODE/ECGA "monitoring mission" in Transnistria to legitimise the "presidential election" in this unrecognised "state". Apart from the Crimean "referendum", Luczak took part in the "monitoring mission" in St. Petersburg on 14 September 2014. The "mission" was coordinated by Piskorski’s ECGA and featured, in particular, "election observers" from the far right parties such as Vlaams Belang (Belgium), Front National (France) and Freiheitliche Partei Österreichs (Austria). Die Linke's collaboration with the far right represents yet another example of the growing trend in the EU, namely the tactical convergence of the (far) left and the far right, especially in foreign policy. The (far) left and the far right vote in a similar way in the European Parliament on the issues related to Putin's right-wing authoritarian regime, while the associates of Die Linke in Greece, Syriza, has recently formed a coalition government with the far right Independent Greeks party. The European far right remains largely a fringe force in the EU, but the "red-brown" collaboration - whether for tactical or any other reasons - between the (far) left and the far right constitutes an increasing threat to liberal democracy in the EU. It remains unclear if far left is threatening on its own or solely because of its links to far right. Each side is too weak on its own. Anton, I wonder if the Italian Northern League support Putin too. Утвержден список европейских правых организаций, которые примут участие в крупнейшем в России съезде, организованном членами партии "Родина". Международный русский консервативный форум 22 марта должен объединить представленные в Европарламенте националистические партии, в том числе такие влиятельные, как греческая "Золотая заря" и Австрийская партия свободы. В списке участников — 11 европейских партий, в том числе представленных в Европарламенте. Среди них греческая "Золотая заря", Национал-демократическая партия Германии (НДПГ), Австрийская партия свободы, Партия шведов, Датская партия, Британская национальная партия и т. д.